Sea ice is still relatively low in both the the Arctic spring and Antarctic autumn. A geographical perspective always helps so here is the status of the sea ice concentration 23 April 2017 for both polar regions. Here is the sea ice concentration 23 April 2017 compared with the 1989-1993 mean on the 23 April. Red shades = less sea ice than the 1989-93 mean on 23 April, and Blue shades = more sea ice than the 1989-93 mean on 23 April. The mean Arctic sea ice for the years 1989-93 on 23 April, the sea ice concentration on 23 April 2017 and the difference between the two data sets. Blue shades imply more sea ice and reds imply decreased sea ice compared with the mean. The original data come from the DMSP SMMI data set at the NSIDC. The stand out regions for me are once more (as in my post in January), the Northern Barents Sea is relatively low, along with the Bering Sea and the Sea of Okhotsk. 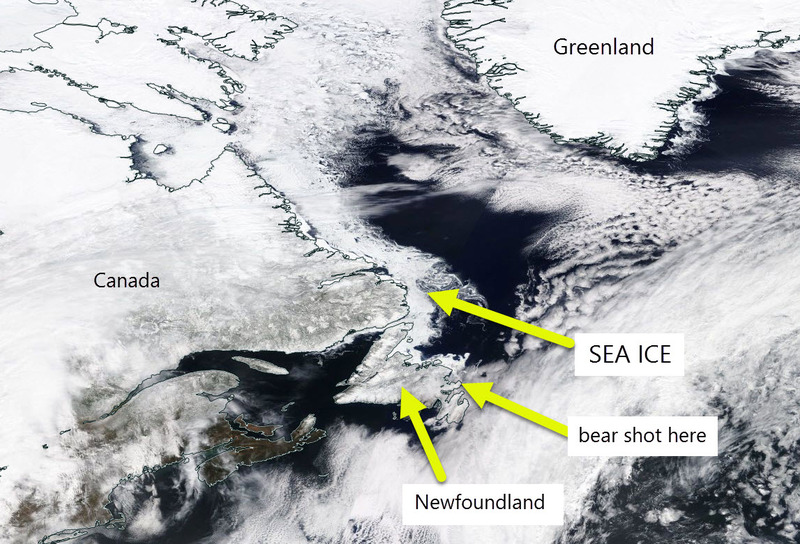 There is a consistent retreat of the ice edge almost everywhere, and comparatively a lot of open water in Hudson Bay. Whilst there is lower than the 1989-93 mean in Baffin Bay, there has been apparently unusually heavy sea ice off the coast of Newfoundland. This is an image from Worldview from 19 April 2017. Date chosen only because it is relatively cloud free. Sea ice off Newfoundland 19 April 2017. CBC News Posted: Apr 10, 2017. 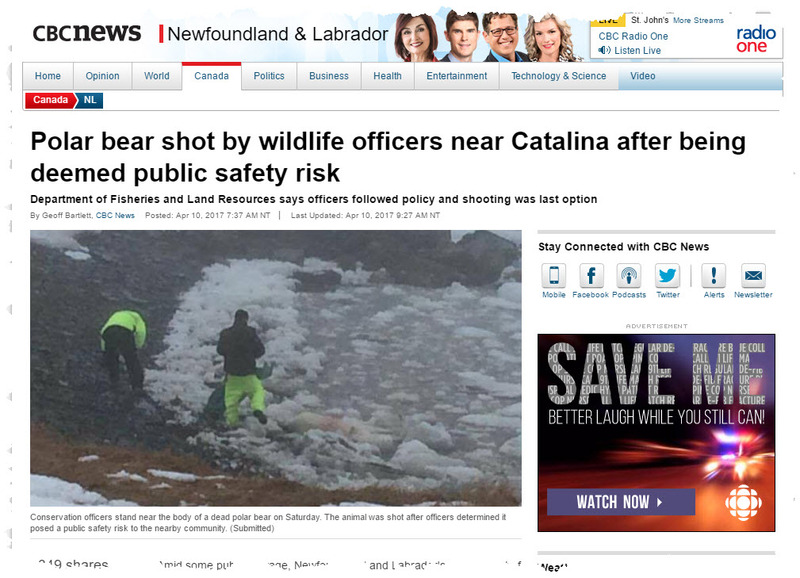 The important thing is this sea ice of Newfoundland represents export of ice from the higher Arctic. The NSDIC Arctic ice extent shows how low the sea ice extent currently is compared with previous data. 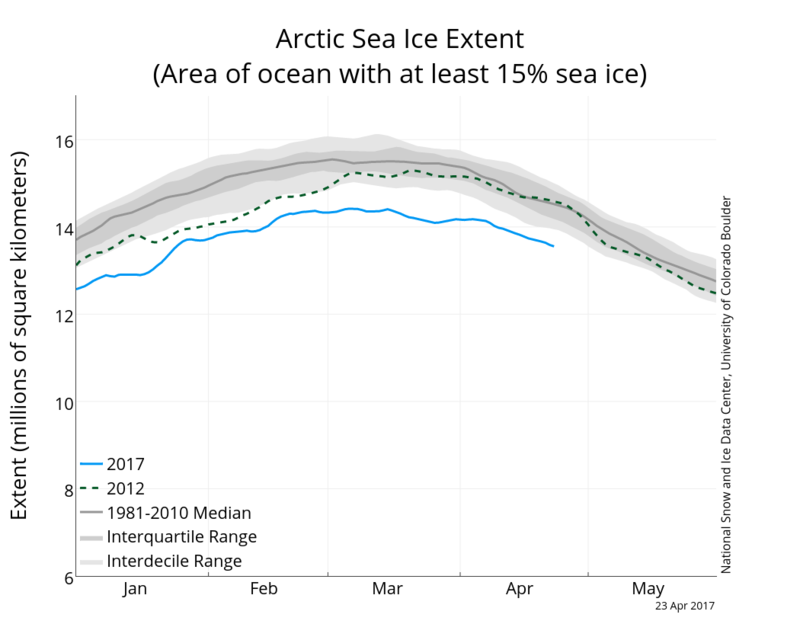 Arctic sea ice extent to 23 April 2017 from NSIDC. The situation in the Antarctic is always more variable because the sea ice has no land boundaries on the northern edge. So I show it slightly differently to give an concept of this variability. This is the sea ice on 23 April for 1989, 91, 92, 93, 94, 95 and 23 April 2017. The mean Antarctic sea ice for the years 1989-93 on 23 April, the sea ice concentration on 23 April 2017 and the difference between the two data sets. Blue shades imply more sea ice and reds imply decreased sea ice compared with the mean. The original data come from the DMSP SMMI data set at the NSIDC. The extremely low sea ice concentration in the Amundsen and the Ross Sea seen in my earlier post of course remains. This is likely a delay in freeze up through heat stored in the upper ocean through the Antarctic summer. There is also low sea ice extent in the Eastern Weddell Sea and off the coast of Dronning Maud land. Finally the NSDIC sea ice extent shows the sea ice is still surprisingly low compared with all previous satellite data. 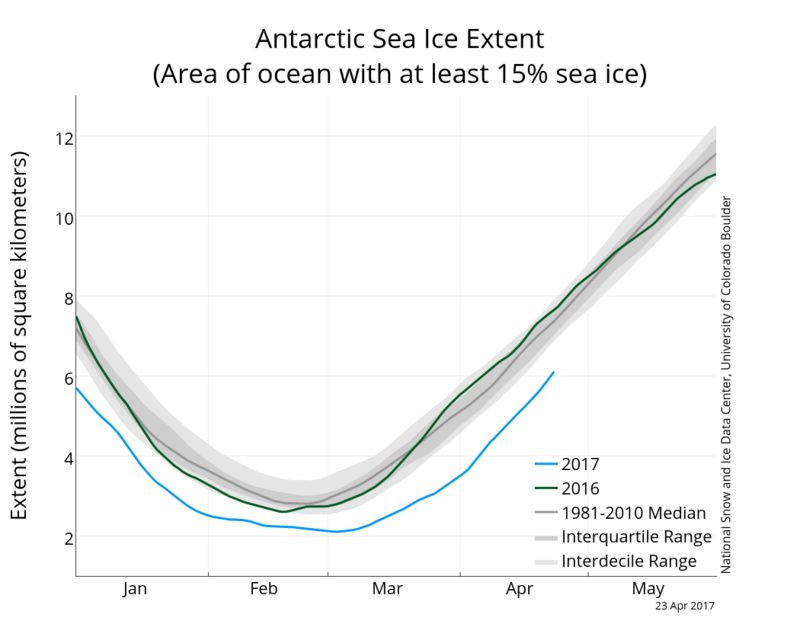 Antarctic sea ice extent (with greater >15% sea ice cover) 23 April 2017. From NSIDC. So towards the Arctic summer, and the Antarctic winter. Will we see a new summer record low in the Arctic sea ice extent? Dr James Screen (Exeter University) gave a 33% chance a few days ago. Whilst in the Antarctic Readings Dr Jonathan Day recently wrote about how the Antarctic sea ice is becoming more variable. And will there be another Weddell Polynya like in 2016? Posted in Science. Tags: Antarctic, Arctic, DMSP, sea ice, sea ice extent, SMMI on April 25, 2017 by Mark Brandon.